There were some pretty innovative solutions being demonstrated at the 2011 HIMSS Conference. One of the most interesting demonstrations I saw was at the NextGen booth on the new NextPen. Roy Feague Vice President, Development at NextGen Healthcare showed me some the uses for the pen and explained future plans for its development. "There are really only three modes of communication being used in healthcare: typing, voice and writing. We have done a good job at capturing data from typing and voice recognition, but up until now we've done a poor job of capturing writing," said Roy. "This will extend the reach of the EHR quite a bit. Anybody who can hold a pen can become a data contributor to the EHR, including patients." The immediate use case available now is to allow patients to complete intake forms while waiting to be seen. Future plans include allowing clinicians to enter data into forms that will be captured as discrete data elements within the EHR templates. This could be handy to help those practices using NextGen that may have some clinicians struggling moving to digital from paper. But capturing patient demographics and other patient provided information prior to rooming is an immediate win, saving time and increasing accuracy. Using laser printers and ordinary copy paper (although the results are definitely best with a color laser printer - I would not recommend using back and white), NextGen prints an intricate algorithm of barely discernible dots on the background of the page. Printing this dot pattern on the paper makes it possible for the NextPen's built-in camera to detect pen strokes and record handwriting that can then be stored and sent digitally. Every small area of the pattern has a unique combination of dots with different positions. 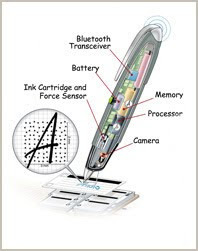 When the user writes on the digital paper, the digital pen captures information about what the user writes and where, by registering the pattern close to the pen tip. A tiny camera in the pen’s tip captures everything as it is written or drawn. The camera automatically takes digital snapshots of the dot pattern on the paper at a rate of between 50 and 100 images per second. Every snapshot contains enough data to enable the pen’s image microprocessor to determine the exact position of the digital pen, what it writes or draws, and what form is being used. Then the pen is placed in a USB docking station, the data is approved, and NextPen automatically fills the structured data fields into the EHR. An image of the form can also be captured and automatically attached to the patient’s record. Saving the image would create an ideal situation for signatures and drawings, while also keeping an exact record of the data entered. The 2010 ONC Update on December 14-15, 2010 was an opportunity for the ONC to not only update all of the grantees under the HITECH Act, but also to hear from them on the progress and challenges faced so far. "This year, significant strides were made in health information technology. And for us, information technology has always been a means to an end, the end of improving health, improving the health system, making the lives of our fellow Americans better, making our nation’s health professionals and institutions able to live up to their aspirations, empowering Americans to have and take control of their own health and lives. These are the reasons why the Congress and the President enacted the HITECH Act and the reason that the Office of the National Coordinator exists today," said Dr. David Blumenthal in a blog post. There are more videos here and transcripts are under the opening remarks below. Welcome and opening remarks from David Blumenthal, MD, MPP, National Coordinator for Health Information Technology, Office of the National Coordinator for Health Information Technology (ONC) and Kathleen Sebelius, Secretary, U.S. Department of Health and Human Services (HHS). On Wednesday February 2, 2010 the ONC announced the launch of real world implementations of the Direct Project services and protocols. The success of this project shows how effective the open collaborative approach embodied in the Direct Project can be, and this is already being used as a template for the Standards & Interoperability (S&I) Framework. This successful example of the innovative approach of using government as a platform will continue to have a resounding impact throughout the operations of government. "This is a new way of doing the public's business, and it works," said Aneesh Chopra, the White House Chief Technology Officer. "Instead of the traditional top-down approach, it calls on stakeholders to work together in a more open and fast-moving way to achieve results. It makes government a platform for innovation by those who really know the field. Then it makes their work available for the public good, and it serves as a basis for competition among the very entities that brought it about. It is a new model of challenge and cooperation, and the Direct Project is an example of how effectively it works." Then on Thursday, February 3, 2010 Kaiser Health News broke the story that Dr. David Blumenthal, National Coordinator for Health Information Technology, announced that he is stepping down this spring to return to his teaching post at Harvard University. Blumenthal announced his decision in a memo to his staff on Thursday, saying that he originally planned to stay in the office of national coordinator job for only two years when he accepted the position in March 2009, which was generally understood since he would be putting his tenure at risk if he stayed longer. In less than two years Dr. Blumenthal has done some incredible work at putting the billions of dollars from the American Recovery and Reinvestment Act's HITECH Act into motion. "David is a remarkable person who has really made a difference," said Dr. John Halamka, CIO at Harvard Medical School and Beth Israel Deaconess Medical Center in Boston. "The pace of EHR adoption, health information exchange, and quality measurement has rapidly accelerated during his tenure," said Halamka, who is also vice chair of the HIT Standards Committee, which makes recommendations about health IT standards to ONC. "I'm confident that the policy and technology foundation he has built will serve the country for years to come," said Halamka in an email interview with InformationWeek. I think it is likely that Farzad Mostashari, MD, ScM, who serves as Deputy National Coordinator for Programs and Policy within the Office of the National Coordinator will eventually take the helm. This would be an excellent choice and provide not only continued excellent leadership with vision and enthusiasm, but also allow for a sense continuity within the ONC. This will be very important as increasingly difficult budget constraints are placed on federal operating budgets. Other big news was that on Monday, January 31, 2010 U.S. District Judge Roger Vinson ruled that a provision of the health reform law requiring Americans over 18 to obtain insurance coverage exceeded the power of Congress to regulate commerce under the U.S Constitution. In his ruling he said he agreed with arguments that because the insurance mandate is central to the legislation, and there is no clause for severability, the entire legislation must be voided. The U.S. said it may seek to block the decision while it appeals. This is an issue that will definitely be decided by the Supreme Court and I'll be writing more about it, particularly the health information technology implications, in future posts. On January 31, the National Committee for Quality Assurance (NCQA) released new standards for its Patient-Centered Medical Home (PCMH) program. The new standards call on medical practices to be more patient-centered, and reinforce federal “meaningful use” incentives for primary care practices to adopt health information technology. The patient-centered medical home is a model of care emphasizing care coordination and communication to transform primary care into “what patients want it to be.” Research shows that medical homes can lead to higher quality and lower costs, and improve patients’ and providers’ reported experiences of care. The release of NCQA’s new standards—PCMH 2011—marks the debut of the next generation of the NCQA Recognition program that designates high-quality primary care practices as patient-centered medical homes. Expansion of this program—a 3,400% increase in recognized clinicians and a 5,200% increase in recognized sites since 2008—makes it NCQA’s fastest-growing service. As of the end of 2010, almost 7,700 clinicians at more than 1,500 sites across America used NCQA standards as a roadmap to become high-quality primary care practices and receive NCQA Recognition as patient-centered medical homes. “NCQA’s new medical home standards will enhance care coordination, clinician and staff satisfaction and primary care quality nationwide, while putting patients in the driver’s seat to manage their health,” explained Susan Edgman-Levitan, leader of the 22-member advisory committee that helped NCQA create PCMH 2011 and Executive Director of the Stoeckle Center for Primary Care Innovation at Massachusetts General Hospital. To an unprecedented degree, PCMH 2011 directs practices to organize care according to patients’ preferences and needs. Standards emphasize access to care during and after office hours, and managing care in collaboration with patients and families. Other aspects of patient-centeredness include providing services in patients’ preferred languages, helping patients with self-care and facilitating patient access to community resources. PCMH 2011’s emphasis on patient feedback supports what is widely known as the “triple aim” (improving quality, containing costs and enhancing patient experience). NCQA is collaborating with the Agency for Healthcare Research and Quality to develop a medical home version of the Consumer Assessment of Healthcare Providers and Systems (CAHPS) Clinician & Group Survey, a widely used evaluation of patient experience. NCQA expects to release CAHPS for medical homes in the second half of 2011. Starting in January 2012, practices may receive additional NCQA Distinction by voluntarily reporting patient experience data. To support patient-centered care for children, PCMH 2011 standards include parental decision making, teen privacy and guardianship. Standards also cover communication between medical facilities about newborns’ lab results and guidelines for planning the transition from pediatric to adult care. Federal “meaningful use” language is embedded in PCMH 2011 evaluation standards, reinforcing incentives for practices to use health information technology to improve quality. The standards’ alignment with meaningful use creates a virtuous cycle: practices that meet PCMH 2011 requirements will be well prepared to qualify for meaningful use, and vice versa. Download PCMH 2011 standards free of charge at www.ncqa.org/view-pcmh2011.